A new PNNL study shows that 17 percent of the United States' imported oil for transportation could be replaced by biofuel made from algae grown in outdoor raceway ponds located in the Gulf Coast, the Southeastern Seaboard and the Great Lakes. This June 2010 photo shows raceway ponds in Southern California and was taken by the QuickBird satellite. RICHLAND, Wash. — High oil prices and environmental and economic security concerns have triggered interest in using algae-derived oils as an alternative to fossil fuels. But growing algae — or any other biofuel source — can require a lot of water. However, a new study shows that being smart about where we grow algae can drastically reduce how much water is needed for algal biofuel. Growing algae for biofuel, while being water-wise, could also help meet congressionally mandated renewable fuel targets by replacing 17 percent of the nation's imported oil for transportation, according to a paper published in the journal Water Resources Research. Researchers at the Department of Energy's Pacific Northwest National Laboratory found that water use is much less if algae are grown in the U.S. regions that have the sunniest and most humid climates: the Gulf Coast, the Southeastern Seaboard and the Great Lakes. "Algae has been a hot topic of biofuel discussions recently, but no one has taken such a detailed look at how much America could make - and how much water and land it would require — until now," said Mark Wigmosta, lead author and a PNNL hydrologist. "This research provides the groundwork and initial estimates needed to better inform renewable energy decisions." Algal biofuel can be made by extracting and refining the oils, called lipids, that algae produce as they grow. Policy makers and researchers are interested in developing biofuels because they can create fewer overall greenhouse gas emissions than fossil fuels. And biofuels can be made here in the United States. In 2009, slightly more than half of the petroleum consumed by the U.S. was from foreign oil. Wigmosta and his co-authors provide the first in-depth assessment of America's algal biofuel potential given available land and water. The study also estimated how much water would need to be replaced due to evaporation over 30 years. The team analyzed previously published data to determine how much algae can be grown in open, outdoor ponds of fresh water while using current technologies. Algae can also be grown in salt water and covered ponds. But the authors focused on open, freshwater ponds as a benchmark for this study. 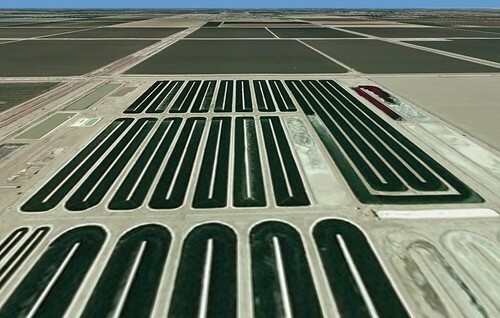 Much of today's commercial algae production is done in open ponds. First, the scientists developed a comprehensive national geographic information system database that evaluated topography, population, land use and other information about the contiguous United States. That database contained information spaced every 100 feet throughout the U.S., which is a much more detailed view than previous research. This data allowed them to identify available areas that are better suited for algae growth, such as those with flat land that isn't used for farming and isn't near cities or environmentally sensitive areas like wetlands or national parks. Next, the researchers gathered 30 years of meteorological information. That helped them determine the amount of sunlight that algae could realistically photosynthesize and how warm the ponds would become. Combined with a mathematical model on how much typical algae could grow under those specific conditions, the weather data allowed Wigmosta and team to calculate the amount of algae that could realistically be produced hourly at each specific site. The researchers found that 21 billion gallons of algal oil, equal to the 2022 advanced biofuels goal set out by the Energy Independence and Security Act, can be produced with American-grown algae. That's 17 percent of the petroleum that the U.S. imported in 2008 for transportation fuels, and it could be grown on land roughly the size of South Carolina. But the authors also found that 350 gallons of water per gallon of oil — or a quarter of what the country currently uses for irrigated agriculture — would be needed to produce that much algal biofuel. The study also showed that up to 48 percent of the current transportation oil imports could be replaced with algae, though that higher production level would require significantly more water and land. So the authors focused their research on the U.S. regions that would use less water to grow algae, those with the nation's sunniest and most humid climates. But the authors also found that algae's water use isn't that different from most other biofuel sources. While considering the gas efficiency of a standard light-utility vehicle, they estimated growing algae uses anywhere between 8.6 and 50.2 gallons of water per mile driven on algal biofuel. In comparison, data from previously published research indicated that corn ethanol can be made with less water, but showed a larger usage range: between 0.6 and 61.9 gallons of water per mile driven. Several factors — including the differing water needs of specific growing regions and the different assumptions and methods used by various researchers — cause the estimates to range greatly, they found. Because conventional petroleum gas doesn't need to be grown like algae or corn, it doesn't need as much water. Previously published data indicated conventional gas uses between about 0.09 and 0.3 gallons of water per mile. Looking beyond freshwater, the authors noted algae has several advantages over other biofuel sources. For example, algae can produce more than 80 times more oil than corn per hectare a year. And unlike corn and soybeans, algae aren't a widespread food source that many people depend on for nutrition. As carbon dioxide-consuming organisms, algae are considered a carbon-neutral energy source. Algae can feed off carbon emissions from power plants, delaying the emissions' entry into the atmosphere. Algae also digest nitrogen and phosphorous, which are common water pollutants. That means algae can also grow in — and clean — municipal waste water. "Water is an important consideration when choosing a biofuel source," Wigmosta said. "And so are many other factors. Algae could be part of the solution to the nation's energy puzzle — if we're smart about where we place growth ponds and the technical challenges to achieving commercial-scale algal biofuel production are met." Next up for Wigmosta and his colleagues is to examine non-freshwater sources like salt water and waste water. They are also researching greenhouse ponds for use in colder climates, as well as economic considerations for algal biofuel production. The paper describes research funded by DOE's Office of Energy Efficiency and Renewable Energy.